I have been hearing and reading with great concern about the problem of drug trafficking and drug abuse in Punjab. As per ground reports, it certainly has assumed very serious proportions, to the extent that it is destroying a generation of youth of Punjab known for physical prowess and stamina. India today needs all of its youth to contribute to nation-building. First, the focus must be to reduce demand and cut off supplies. To do this we must begin with the local politician, which includes the municipal councillor and the village heads. They are closest to the ground. They must delink themselves any seller or supplier, and have to be prime educators. 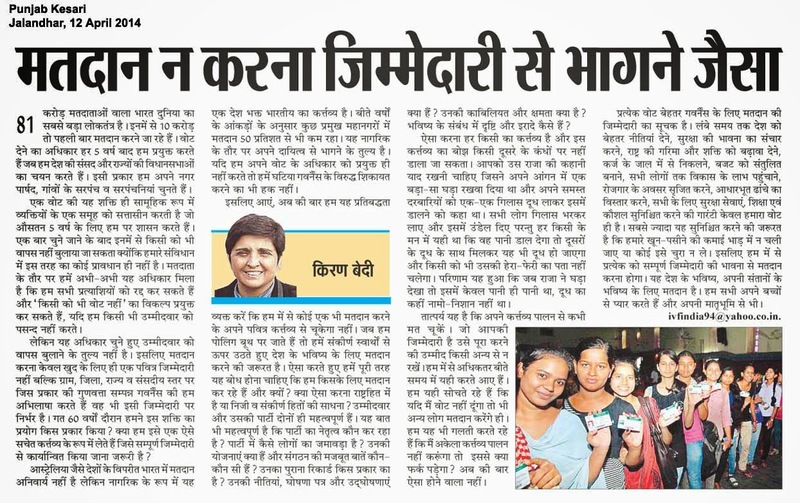 Let me share with you most humbly some practical ideas on how we diminished the problem of drug sale and abuse in one of my postings in Delhi Police. The strategy is simple and comprehensive. We must begin with the existing resources, with a commitment to considering the drug abuse as an epidemic. The plan requires a team-leadership that is accountable and transparent. With this system in place, the Punjab situation can improve in the next two to three years. To reduce the drug demand, there have to be more responsible parents and teachers who ensure no students drop out of schools; and community leaders who are looked up to for guidance. They must collectively mobilise resources for setting up holistic treatment centres. Local politicians also need to create skill-training programmes which generate employment in their respective areas, encourage sports and various other creative activities. Second, politicians must not interfere with law-enforcement authorities to ensure effective interdiction both on supply and demand side. Police must enforce the law effectively, firmly and fairly as this is their primary responsibility. Through systems of community policing, the police can be assisted on information on traffickers and addicts. They need strong support of social and health departments to open and run treatment centres. Abusing drugs even for personal consumption is an offence, though under certain conditions. Such as those indulging in violent behaviour, which almost all do, must be jailed and treated inside the jail for reasons of restraint. Prisons too have to be drug-free with treatment centres. Addicts must be released only conditionally, which is, to remain drug-free with regular reporting to the treatment centres. Courts must be moved for forfeiture of sureties in cases of breach of bail conditions. A database must be kept of all traffickers and abusers, for law to be applied on them unsparingly. This will send a clear message to all that drug crime will not pay. In the ’90s, we faced a similar sort of situation in Delhi and did not let anyone worth his salt interfere in police work. We booked them if they made a bad recommendation, thus neutralised them. Police must work in close cooperation with the Narcotics Control Bureau, the Border Security Force, the Customs and other intelligence agencies. For this, the state police leadership or bureaucracy is vital. Coordination ensures success. The local administration like the district magistrates and superintendents of police are important hubs for local coalitions. As a crime-prevention measure we used to track addicts, either arrested them in preventive sections of law or under drug offences or sent them for treatment on need basis. Actually, for the first time we in Delhi Police opened our own treatment centres to meet the demand. It worked. This was the rehabilitative role of community policing. Crime prevention cannot be without the support of community. For this we created border groups and worked with local bodies on a regular basis. We also opened toll-free phone lines to inform us of sale or consumption. This sent the scare. The judiciary too has a vital role in expediting drug cases and punish stringently. Delayed trials make drug cases ‘rewarding’ as by then substantial money has been made. Drug money must not be seen to be ‘enriching’. Under the law, properties can be attached. Regular update in law training is essential for enforcers too. We kept track of all drug trials. And ensured we keep past criminals and addicts under local watch. If they slipped, we went back to court to cancel their bails, which meant stiffer penalties. The problem is of our own creation, thanks to weakening of governance and breakdown of social systems. Public representatives must take the lead, with unsparing and impartial police, caring parents and strict teachers, responsible community participation, and expeditious judiciary. All must work in tandem. We made this happen, and succeeded. This plan is based on not mere recall, but duly documented. And it was a major reason recorded in my Ramon Magsaysay Award citation in 1994. Where there’s a will, there is a way — not a cliché, it’s true! India is world's largest democracy with 81 crore voters, of which 10 crore are first-timers. The right to vote comes to us every five years to elect our Parliament and state assemblies. We also elect our municipal councillors and panchayats. It is this one vote collectively counted that brings into power a group of people who then govern us for five years. None of them can be recalled once elected for there is no provision in our Constitution to do so. We as voters have only been recently given the right to 'No Vote' if we do not like any candidate. But even that does not amount to recalling the elected candidate. Sacred responsibilityHence, voting is our sacred responsibility for the quality of governance of the village, district, state and the country. How have we exercised this power in the past over 60 years? Did we consider it as a conscientious duty which must be performed with a sense of full responsibility? Voting is not compulsory in our country unlike in some other countries such as Australia. But it is our duty as a citizen. In the past, in some key metropolitan cities, the voting percentage was even less than 50%. This is negation of one's responsibility as a citizen. If one does that, one has no right to complain about bad governance. Hence, let us commit that this time no one will miss this sacred duty. Once at the polling station, we need vote for the future of the country rising above narrow interests. We should know full well who are we voting for and why. Is it in national interest or we are having a personal and narrow view? Both the candidate and party are important. Also, by whom is the party led? Who all does the party comprise? What is their spread and organisational strength? What is their past record? What are their policies, manifestos and declarations, their capability and capacity, their vision and intention? This is everyone's duty that cannot be delegated. There was once a king who one day asked all his court persons to bring a glass of milk each and pour it in a big pitcher placed in the centre of the courtyard. People thought how did it matter if they did not bring in milk because their water would get mixed with the others' milk. Little did they realise that many others were thinking on similar lines. So when the king saw the pitcher, it had only water. Moral of the story: do your duty and don't expect others to do what you are supposed to. This is what many of us voters did in the past thinking what if I didn't vote, others would. Or if I voted with a sense of irresponsibility, it wouldn't matter for I would have the right to claim good governance anyway for others would vote with responsibility. It won't happen this time. Each vote is a responsibility for voting for good governance, which ensures longevity, sustainability and right policies, which are in the best interest of the country, giving people a sense of security, enhancing prestige and power of the nation, getting out of debt traps, balanced budgets, inclusive growth, generating employment, increasing infrastructure, ensuring health care, education and skills for all and more. Most of all ensuring our hard-earned money is not wasted or stolen. For this each of us has to cast our vote with a full sense of responsibility. It's a vote for our future and the future of our children. We all love our children. And we love their motherland, which is ours too.